Kuala Lumpur, January 29, 2016 – Reflection on the smartphone market in the past couple of years suggests that innovation in this segment has plateaued. The smartphone has consolidated into a standard rectangular touch screen with a powerful processor, a highly capable camera and as big a battery as is possible within the constraints of a sleek design. But innovation hasn’t come to an end — it’s just harder than ever to make a significant advancement. Improvements are largely incremental, and manufacturers face a challenge to make their devices stand out in the current smartphone “sea of sameness”. Samsung’s use of a dual-curved display, for example, helped the company to set its flagship Galaxy S6 edge apart from Android-powered rivals, and Apple’s addition of 3D Touch to its latest iPhone gave a new dimension to its now-familiar design. The reality is that such changes are a far cry from the major disruptions seen in the past fifteen years, with the transition of the market from candy bars to flip phones, to sliders and more unusual designs like circular handsets. However, we shouldn’t lose sight of the progress despite a perceived slowdown in innovation. Billions of consumers now carry a device in their pocket that’s more powerful than the PC they owned just a few years ago, and these handsets are able to connect with others via 2G, 3G, 4G, Bluetooth and Wi-Fi network technologies. It’s true that consumers might not be as excited about smartphones as they used to be. 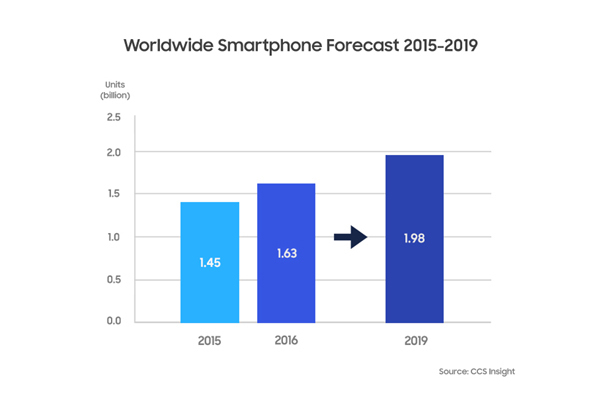 But CCS Insight’s latest forecasts anticipate that a staggering 1.6 billion smartphones will be sold in 2016 — a figure that’s expected to rise to nearly 2 billion by 2019. The smartphone has become part of the fabric of society, and is now the most prolific consumer electronics device on the planet. It’s not so long ago that mobile phones were about little more than making and receiving phone calls. But they’ve become our constant companions — our cameras, our music players, our portable TVs and our gateway to the Internet and a host of apps. The innovation doesn’t stop, and now you can even clip your phone into a headset and be transported into a world of virtual reality. Smartphones have made that possible, and CCS Insight expects that millions of consumers will be using their handsets in this way by the end of 2016. The competitive landscape inevitably changes as markets mature. CCS Insight believes that success lies with the companies that have the scale and resources to compete in a world where margins are squeezed even as volumes rise. Apple’s current momentum seems unstoppable, but Samsung remains the largest manufacturer of smartphones by volume. This scale is its most important asset as it faces challenges from ascendant Chinese manufacturers like Huawei, which have built on their home-market advantage to expand on a global basis. The connected device industry is also diversifying into new areas, with wearables presenting a growing opportunity. 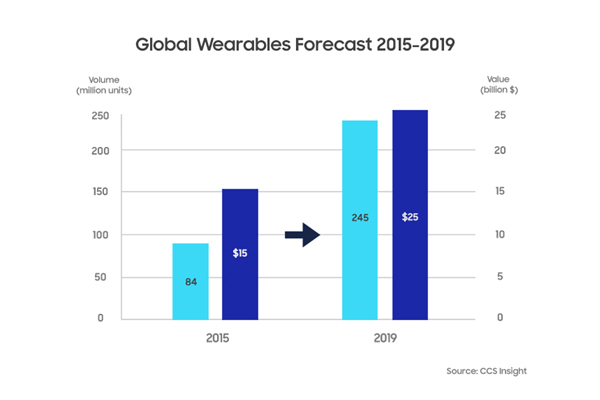 CCS Insight forecasts that sales of wearable devices will triple from 2016 to 2019, with sales of almost 250 million units and a market value of more than $25 billion. We expect 2016 to be a tipping point for wearables, as they evolve from niche devices with functional designs to more fashionable products with broader appeal. I’m confident that 2016 will finally see the arrival of stylish options that ordinary consumers will want to wear. These devices are also beginning to offer more compelling features, particularly in the area of health. We anticipate that 2016 will mark a shift from what CCS Insight terms “recreational health” to more meaningful functions that can closely monitor a user’s condition and make a difference to their life. The advent of the Internet of things — a term loosely encompassing a wide variety of connected devices — demonstrates that innovation isn’t confined to devices that we carry or wear, either. This segment will become more defined in the coming years as companies focus on specific market opportunities like the Internet of sport, medicine or transportation, and our homes will become more connected. The secret to success will be making the user experience as seamless as possible, and big players like Amazon, Apple, Google and Samsung have the opportunity to lead the way in this next wave of development. Furthermore, the smartphone will continue to play an important role, often being the device used to control many of these new experiences. I strongly believe that the perception that industry innovation has plateaued is far from the end of the story. Further disruptive moves will emerge as our lives become even more connected, and innovation will come from a variety of avenues including machine learning and artificial intelligence. I continue to have unwavering enthusiasm for connected technology, and look forward to being among the first to try these new experiences as they’re developed.